My sister came over last night to hang out and persuaded me to bake cookies at 9pm. We used a recipe from bakingbites.com and I adjusted it to be gluten free. I think it was worth the late night effort, although she did get a little sloppy with the chocolate coating around midnight. 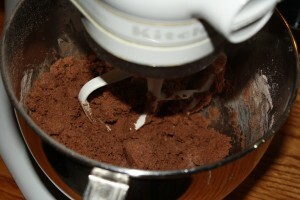 With the mixer on low speed, add in the milk, vanilla and peppermint oil. Mix the remaining dry ingredients another bowl. Slowly add the flour mixture to the butter mixture until it is fully incorporated. Shape the dough into two 1 1/2 inch logs, wrap in plastic wrap and freeze for 1-2 hours until the dough is firm. Slice dough into rounds not more than 1/4 inch thick – You don’t want them too thick or they won’t be crispy. 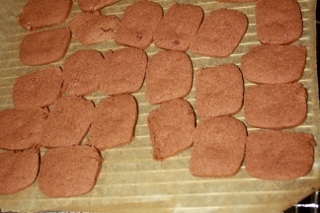 Place them closely on a baking sheet lined with parchment paper (they don’t really spread out when they bake). Bake for 13-15 minutes on the middle rack, until cookies are firm. 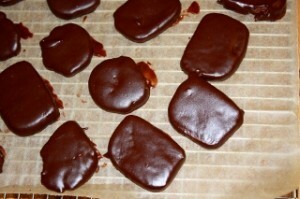 Melt the chocolate and butter in a double broiler or the microwave until chocolate is smooth. Add the peppermint oil. 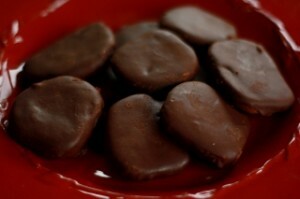 Chocolate should have a consistency somewhere between chocolate syrup and fudge for a thin coating. Reheat chocolate as needed to keep it smooth and easy to dip. Dip each cookie in the melted chocolate, turn with a fork to coat, then transfer to a piece of parchment paper or wax paper to set up. I put mine in the freezer.